Princess Kelsey Bandar stared at the graveyard of dead warships. Fifty thousand wrecks from the civil war that destroyed the Terran Empire five hundred years ago. She must lead the fight against the forces that killed those ships. The implacable artificial intelligences of the Rebel Empire. With five old and damaged ships at her command, that seemed an impossible battle. One she must win. 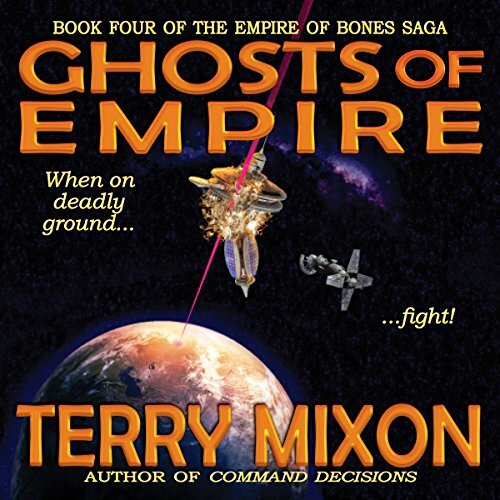 If you love military science fiction and grand adventure on a galaxy-spanning scale, grab Ghosts of Empire and the rest of The Empire of Bones Saga today! The book is reasonably well written but the underlying premise is too weak. Our brave soldiers are cowed into submission by a shrill woman and must wait subserviently until she chooses to return or murder their crew. Just too pitiful a premise but the action is fun. I've come to really love this series. The story is creative, there's everything from action to good characters, and the writing is good. I've said before with previous books that I would really start at the beginning of the series if you're looking to start with this one. There is too much backstory to understand to really appreciate this book fully if you start here. Narrator is excellent just like in previous books in the series. amazing continuation of the story and the world. I couldn't put it down. Once again Mr mixon and Mrs Giguere were awesome. Mixon really nailed this one. Some of what happened in book 3 left me feeling stagnant, but I am so in love with the characters and setting that I could not turn down reading book 4. This was a refreshing new situation for our characters, with some new people to interact with, and just a whole plethora of possibilities. I was on the edge of my seat the whole book, and I am pumped for book 5! I got into this series by accident and am very glad I did. I am really enjoying the ongoing story and the narration is great. This one is well worth the credits. Terry Mixon's does it again. This is a thrill ride, again I couldn't stop listening. I received this audio book at my request from the author, publisher or narrator for a honest review. Action-packed, Easy-to-read, Entertaining, Great world building, Original, Page-turner, Unpredictable, Witty, Wonderful characters. Wow. Fascinating story with characters we love. 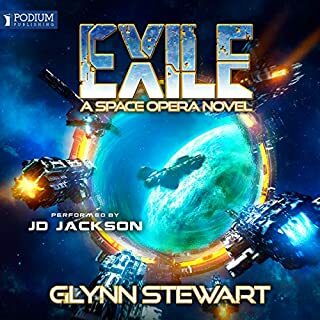 What made the experience of listening to Ghosts of Empire the most enjoyable? Battles in space and on land. Car chases and fights. Caring people with close relations to their crew. With Terry's writing we have come to be very close to our characters here. We've slowly added new characters that I've grown attached to as well. Now we are adding more people to the mix. It sounds like a lot of people, but the way Terry adds them keeps them all individual and easy to get to know before adding more to the group. I love this as it does not stress me out. He introduces them in their 'home' environment and when they appear on the page it's in relation to who and where they are, even not spoken or written. This makes it very easy for me to remember who's who in this growing cast of characters. Oooooh this book. There is so much to learn! We start to learn details of the Rebel Empire and how it's set up with their lords and rulers. Very interesting. Just when I thought things could get boring, Terry surprises me and keeps me held fast to the book. Things could easily be repeated, but they aren't. What we learn and deal with at Harrison's World grows to new heights, unlike at Pantagar. We see how two worlds collide with needs and desires to do more. There are items that both want, yet only one has and can have. There is also desires for more on the new world we are negotiating with, Harrison's World. These worlds are damaged and the people are angry. Different people want different things - revenge, freedom, power, and more. There are people who want to rebel against the Rebel Empire and others with plans of their own. 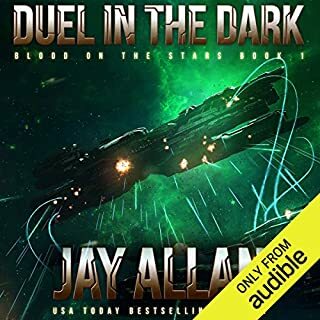 All clash as Jared and Kelsey work to get their people freed from Harrison's World. Will they make a new ally or an enemy? Or come to even grounds? There is a different hierarchy here, and it's going to be difficult to get anywhere. This book had me groping for all sorts of ideas on how things could turn out. Oh to see how the people of Harrison's World who want to rebel against the Empire have worked for what little they have in place, and to know where those items are. Wow. There is more in common with Jared and Kelsey with Olivia and her people, they just don't know it right away. I worried how this common ground could be destroyed before it's ever found because everyone's so worried about keeping things safe against the AI and their Rebel Empire. The creation of the Rebel Empire and their treatment of the planets is a feeding ground for rebellions and conspiracies. People wanting to be free. People wanting to climb the power ladder. It's a crafty web people weave to get what they want, and the extents they will go to. I was worried and anxious for all our friends, old and new, hoping things would turn out as they get into tight spots. I'm always mesmerized at the craftiness of authors that create systems and conspiracies this deep and this believable. Amazing talent! Veronica is talented at keeping pace with the excitement of the story. When the events pick up pace and the heart of the characters is pumping, Veronica has the feel of the fast tension to her voice, drawing me into the rush of the moment. Yet, Veronica is crystal clear in speaking so I know exactly what she says. There are moments through the book that have an echoy sound to them. I'm not sure what this is or why, me or the recording, I'm not sure. I'm repeatedly wowed at Veronica's ability and beyond any talent to give a vast cast of characters their own voices and personalities. 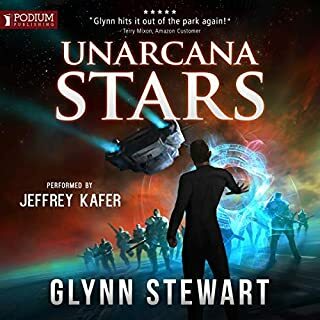 *I was voluntarily provided this review copy audiobook at no charge by the author, publisher and/or narrator. We get the story from Kelsey and Jared's POV's like previous books. But we also get a new view here. Commander Sean Meyer is in a different spot and we get to see from where he's at. And Coordinator Olivia West, who has a special connection to things. Aside from all my rambling, I just love this spectacularly written story, characters, and world! I'm listening to these as fast as they come out! I'm loving the stories of this vast Empire in space, long ago fallen, and now rising from the ashes. If you've enjoyed Jerry Pournelle's Future History (The Mote in God's Eye, War World, and Falkenberg's Legion) you might enjoy these, too. 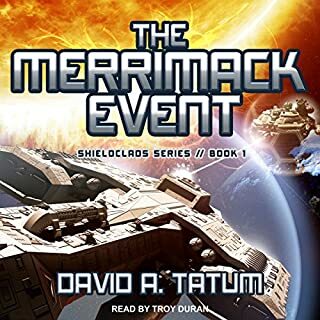 They are a little lighter in tone that Pournelle's, but just as much fun. If you could sum up Ghosts of Empire in three words, what would they be? If you haven’t read book 1 ,2 and 3 then this WILL have spoilers but just know that this series is awesome and 100% worth your time ! Princess Kelsey Bandar and her half brother Jerad (or so they thought) have seen a lot over the last three books from Kelsey finding out that she is not her farther's biological daughter to her twin Brother trying to assassinate Jerad from half a galaxy away.Oh yeah they are also stuck in a part of the old Empire half a galaxy away with no way home ! No biggy .They got this way from setting out on an exploratory mission with Jerad in charge and Kelsey going along as an ambassador on his ship Athena .They went through a weak flip point ( sort of like a designated worm hole sort of thing I think.Its sort of like a stargate for all my fellow SG1 fans.Their being stuck and unable to get home is reminiscent of Stargate Universe actually but this series is original and very intricate . Expect new discoveries in tech ,new and old friends and “Friends” . A very shocking turn where we meet"The Rebil Empire" and some fantastic new friends and wretched new and old enemys .Tragedy strikes in this book and its all a certain knuckle head's fault.I will give you a hint,its our petty rigid friend from the war games all the way back in book 1.But at the end of the book I cant help but think as tragic as it was that it served a perpous in the outcome of Ghosts of an Empire .I will wanr you that we do loose a crew member that I believe all of our hearts reached out to and I admit to sobbing like an idiot for about five minuets .Kelsey is just 90lb of awesome a super strong(not just physically) female lead and somebody I think a lot of people listening or reading will seriously look up to and enjoy.Jerad and Kelsey have to deal with fleet members from home and bring them up to speed on the situation.lets just say it is'nt smooth sailing....flying ...orbiting? they are in here here's a bit about Terry Mixon. He served as a non-commissioned officer in the United States Army 101st Airborne Division. He also worked alongside the flight controllers in the Mission Control Center at the NASA Johnson Space Center for almost two decades, supporting the Space Shuttle program, the International Space Station, and other human spaceflight projects during his tenure there.so think of all of that experience joined with a truly awesome imagination and a nack for top rate creative writing .them we have this series I am looking forward to the next book Paying the Price – Book Five of The Empire of Bones Saga! Veronica Giguere the microphone maestro continues to do her thing and I grow more in awe of her talents as a narrator with every passing word I hear from her. She's on top form with this performance and I really get the impression that she has particularly enjoyed reading this series so far.I received this title for free in exchange for an unbiased review.I was voluntarily provided this free review copy audiobook by the author, narrator, or publisher.I was given book 3 and 4 and then bought books 1 and 2 because starting a series on book 3 would be rather confusing but I would happily have bought all 4 knowing how good these books are. 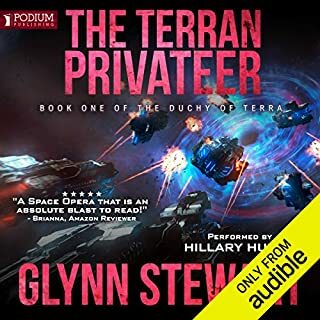 There are 7 book so far in this series and more from Terry that I hope will become available on Audible soon. Another great book in a great series. 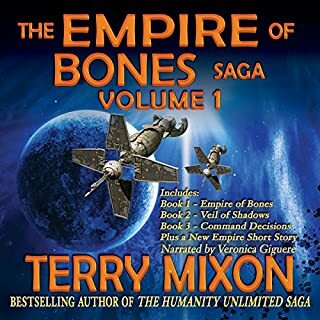 Terry Mixon's superb writing comes together once more with Veronica Giguere's excellent and characterful narration to continue this series. If you liked the others stop here and buy this one now. This is part of a great series of books and I would really recommend that you start from the first book Empire of Bones: Book 1 of The Empire of Bones Saga. I very much enjoyed my time listing to this book. The only problem with this book is the next one is not available on audible.co.uk. Must find out what happens next. I hope there is a lot more books in the future for this setting.